I’m excited to announce that the premiere issue of Eat in Eat Out, Canada’s first (and free!) digital magazine for people who love to cook in or dine out was released today, and I was lucky enough to be featured in it! I was asked to prepare two holiday recipes for the magazine - one will be featured on their homepage at a later time, and the other is featured on pages 48-49 of the current issue: these amazing gingerbread crepes with eggnog whipped cream! It took more time than I expected to come up with two original holiday recipes that I hadn’t seen anywhere else. 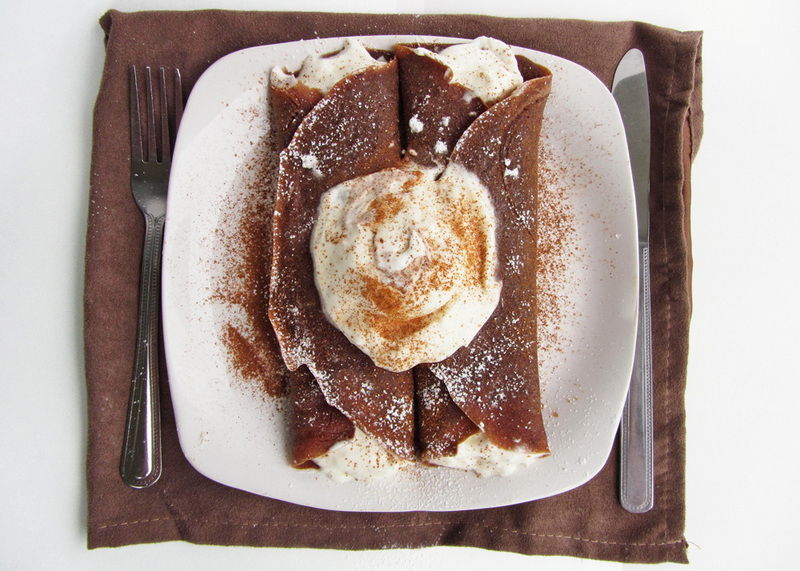 For my first recipe, I knew I wanted to incorporate gingerbread in some way, and since I love making crepes, I decided to create a gingerbread crepe. I found a couple of recipes online but none were quite what I was looking for, so I experimented a little and came up with what I thought was the best crepe I’ve ever made! The gingerbread flavour was spot-on and the addition of cocoa powder gave them that dark brown colour I was hoping for. The crepes are so good on their own, but in keeping with the holiday spirit I wanted to add some sort of eggnog filling to pair them with. I considered making a cream cheese filling, but decided to keep the crepes a little lighter by making an eggnog whipped cream instead. I was a little worried that eggnog wouldn’t whip properly (or at all), but to my surprise and delight, it worked! I’m not sure if it's possible to get stiff peaks from eggnog, but I was able to get soft peaks just fine, which was perfect for filling the crepes. A pinch of nutmeg added to the whipped cream was the perfect addition to bring out the eggnog flavour, and a sprinkling of icing sugar and cinnamon on top of everything added an elegant wintery touch. To get the recipe, go to page 48 of Eat in Eat Out’s holiday issue. And be sure to check out the rest of the magazine while you’re there, it’s full of lots of amazing recipes, restaurant reviews, and contest links! UPDATE: I've since added the recipe below to make it easier for viewing and printing. Eat In Eat Out has also released several new issues, so be sure to check those out! Chill a mixing bowl in the freezer until cold. Pour chilled whipping cream and egg nog into the bowl and beat with the whisk attachment on high until the mixture begins to thicken. Add granulated sugar and continue to beat until soft peaks form, above 5-10 minutes total. Gently fold in nutmeg and refrigerate mixture until ready to use. Whisk all crepe ingredients together in a large bowl. Let sit for 30 minutes. Heat a large non-stick skillet over medium-high heat and spray with non-stick cooking spray. Pour batter by the 1/4 cup full onto the skillet and immediately swirl to cover the pan. Let cook about one minute, until bubbles start to form in the middle of the crepe and the edges pull away from the pan. Gently flip over and cook the other side for about 30 seconds to 1 minute until cooked through. Remove from pan. Repeat with remaining batter, spraying pan in between crepes and separating cooked crepes with layers of waxed paper. 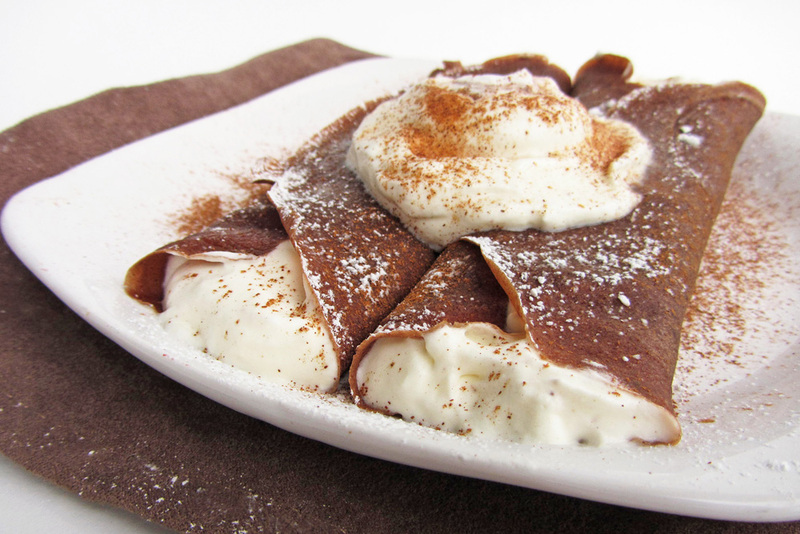 To assemble crepes, fill each warm crepe with about 1/4 cup eggnog whipped cream, and wrap edges around filling. 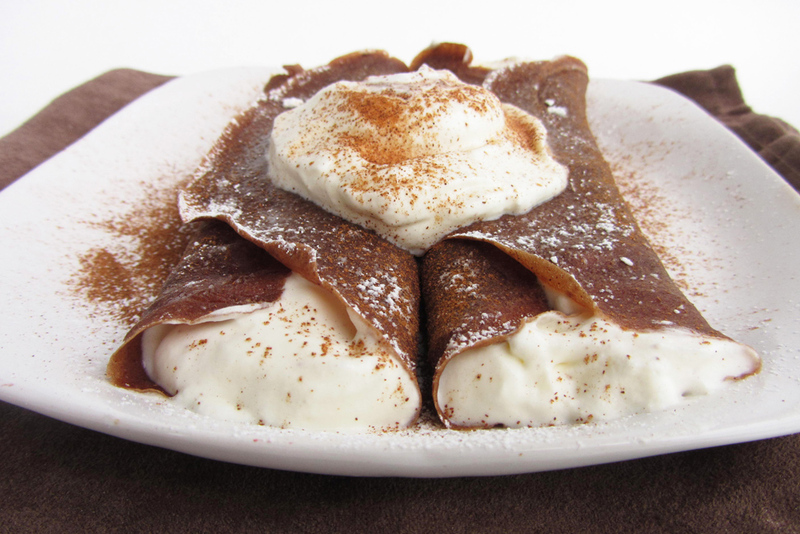 Top crepes with extra whipped cream if desired, and sprinkle with icing sugar, cinnamon, and/or nutmeg. Alternately, you could fold a couple of crepes into triangles then top them with the eggnog whipped cream instead of stuffing them - either works! Congrats on getting in the magazine! These crepes were amazing - both the crepe and the filling! I was happy to help you test the recipe! Wow, awesome holiday recipe! This is definitely original. Congrats on the publication.